BRUSSELS, Belgium -- Europe’s leaders may soon have to choose between a woman and a nation. They should resist the impulse to pick Yulia Tymoshenko over her 46 million fellow Ukrainians. Ukraine, which wants to sign a trade deal and wider association agreement with the European Union at a summit Nov. 28-29 in the Lithuanian capital of Vilnius, has imprisoned Tymoshenko for political reasons. 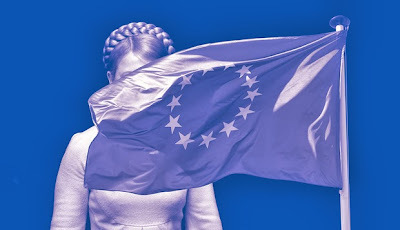 The EU has set Tymoshenko’s release as a condition for the deal, whose primary purpose is to instill the bloc’s standards and values. Why compromise these very values? Yet nothing is so simple when it comes to Ukraine, a nation torn by its history, trade and geography, between Russia to the east and the EU to the west. What the EU’s leaders need to decide is how their economic and security interests -- and those of Ukrainians in developing a more accountable, prosperous and independent country -- will be best served. Refusing Ukraine also risks compromising those goals and values. Tymoshenko, a former prime minister who made a fortune in Ukraine’s spectacularly corrupt natural gas transit business in the 1990s, is hardly an Eastern European Aung San Suu Kyi. She is, however, a symbol. Her jailing in connection with a gas contract she negotiated with Russia in 2009 is at best selective justice, common in Ukraine under President Viktor Yanukovych. She and Yanukovych -- the former pro-Western; the latter long seen as pro-Russia -- have personified Ukraine’s two warring impulses. They are now united, however, on the importance of Ukraine’s integration with the EU. Russian President Vladimir Putin has helped to clarify why the deal with the EU matters. He is demanding that Ukraine join a rival group, the Eurasian Customs Union, which he started in late 2011 with Kazakhstan and Belarus. It has become clear that the Customs Union is just a ruse for restoring Russian influence. Russia has blocked imports at the border with Ukraine, banned wine imports from Moldova, warned of winter gas supply disruptions, and even threatened Armenia with the loss of security guarantees -- all to coerce these countries into joining its union. Europe’s leaders should by now have learned the dangers of allowing Russia to bully its neighbors, as well as the value of having stable democracies on their borders. If Europe rejects Ukraine over the Tymoshenko issue, the decision would be interpreted across the region as EU weakness in the face of opposition from Russia, rather than strength of principle. Ukraine would immediately come under pressure to cut a deal with its domineering neighbor, because it is near bankruptcy. History also shows that non-oil economies of the ex-communist bloc fare better when they integrate with the EU. Ukraine badly needs the kind of institutional and legal regime change that only the EU can reliably provide. It also needs to make the painful adjustments -- ending domestic energy subsidies, for example -- that the International Monetary Fund is demanding in exchange for restoring a $15 billion loan. Russia, on the other hand, offers Ukrainians just one thing: less expensive energy that would come not so much with strings attached as steel cables. Even from the standpoint of Tymoshenko and her supporters, it makes sense for the EU to sign up Ukraine in Vilnius. If Ukraine is rebuffed, Yanukovych is unlikely to suddenly release his archrival, who could then compete against him in elections in 2015. By contrast, if the trade and association agreements go forward, the EU would have more numerous and promising opportunities to continue pressing Ukraine over Tymoshenko. Yanukovych’s conversion to EU values is certainly disingenuous, and rewarding him for the mismanagement of his country is repugnant. Yet the stakes, for Europeans as well as Ukrainians, are much larger than either him or Tymoshenko.